I have vivid memories of standing in line for TSA and watching pilots and flight attendants walk by to get to their flights. They get zipped through the line, and they’re always carrying or pulling very compact bags that look sleek and streamlined. I’ve always wondered how they travel with such small luggage considering the fact that they’re going to be away for days at a time. I imagine that pilots and flight attendants are professional packers like they are professional flyers, and I would love to master that kind of efficiency. I could be wrong, but it looks like they take 12 days worth of clothes including the uniforms they have to wear, and they pack it into a bag that’s the size of my big purse! 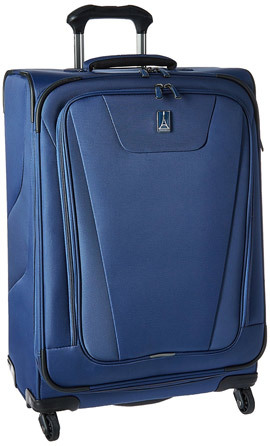 The Travelpro Luggage Maxlite 4 Expandable Spinner bag gets bigger when you unzip the hidden compartments, but it’s also expandable as a set. It comes in 4 different sizes (not counting the totes and rollaboards of this model), from international or regular carry-on to 25-inch and 29-inch for more space. The individual pieces can also be used as a set, and they come in professional tones (depending on the size, but at least in black or blue). The handles on the baggage of the Maxlite 4 are grooved so it’s easier to grip onto them. While people typically transport them using the extendable handle, Travelpro offers other options by providing a way to carry them more easily should that be necessary. As far as mid-level luggage goes, Maxlite 4 is not a huge investment, but should be enough to support the regular traveler who just needs a carryon. The 21-inch is designed to be small enough to toss into the overhead compartment while having enough space for several days’ worth of clothes. Maxlite lets you skip the baggage line and save some time. Maxlite is made to be durable, and it has a different kind of construction that allows for a more reliable exterior without the need for a hard-shell case. This is important because you get the flexibility of canvas, which allows you to pack the bag into a smaller space with the reliability of a hard shell that keeps your belongings safe. The top layer is made with foam and a honeycomb frame which creates a strong exterior that doesn’t add much to the weight. Even beyond this, the bag is protected with extra “skins” and guards that are placed in areas more vulnerable to damage. These pieces keep the case looking like new for longer (something every “flying” professional needs). Spinner wheels offer the kind of freedom that comes with many of these bags while taking the stress off of your arms and shoulders. The ability to move in all directions while being held upright offers you the convenience to transport even a heavy suitcase with just the push of a finger. Beyond that, while you’re moving the bag, the expandable handle has two heights to make it comfortable to use for small or average height people. Travelpro is used by many airline employees for professional trips. If people who get paid to travel are on board for a piece like this one, I don’t think I can come up with any objection to it that will be of much value. Professional Issue or Is It? The one thing that does seem to be a bit of a problem is that the case doesn’t have a small exterior pocket to hold things. It has an exterior pocket, but it’s fairly large and small things, like boarding passes and cords could get lost in it. But then, for me this is a welcome addition to the set! If my opinion is worth anything, I think this luggage is well worth the outlay. Largely, it’s durable, has enough space for everything you’re likely to need for a few days away, and isn’t difficult to maneuver. After all, if the professionals who spend their lives flying use them, what can be so wrong?